The first edition of Soccernomics, published in 2009, is a fantastic read showcasing what the social sciences can tell us about soccer and what soccer can tell us about the social sciences. It is fascinating and thoughtful and it should be thoroughly enjoyable to anyone with even a passing interest in the game. So if you haven't read any edition previously and this sounds like your bag, get on that, and pick up this version given it's the most recent. 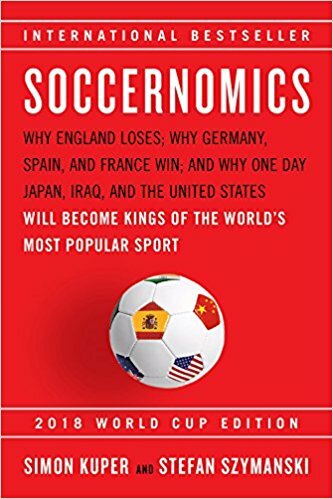 The rest of this review will assume that you've already read Soccernomics but it was probably over 5 years ago or more and you're wondering whether to pick up this new edition. I'm happy to report that Soccernomis: 2018 World Cup Edition is not merely a cash grab attempting to capitalize on the hype surrounding everyone's favorite quadrennial international sporting spectacle (sorry Olympics) but a thorough revamp with plenty of new material, updated data and research, and reflections on predictions that didn't pan out and speculation as to why that was the case. The major sections from the first edition appear to be largely present, but they all have been updated to some extent, and not just with lazy references to flavor-of-2018 teams and players, there is some fundamental reworking. Some of the theoretical sections are similar (e.g. the rationale for investing in assimilating foreign players, how a penalty kick is game theory masquerading as a high-stakes tie-match-deciding device, the countries punching the highest above their weight in the sport) but many of the examples are new and sometimes the theories are amended in light of recent findings and there is analysis of recent crazy happenings such as how Leicester City won the Premier League. 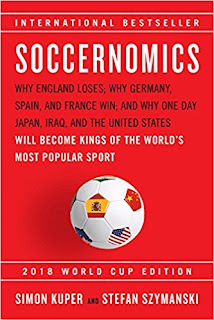 Essentially, if you enjoyed reading Soccernomics the first time, I definitely recommend picking up this book as it is basically more of the same. Yes, some material will be familiar, but the update is comprehensive enough to warrant another purchase/borrow.